Container gardens are magical. Whether they’re made up of colorful flowers or stunning foliage, they can turn an ordinary rooftop into an urban paradise, or transform a bare front porch into an inviting retreat. Smart gardeners know that the key to keeping plants healthy is good drainage. 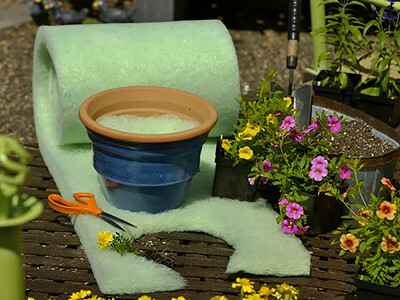 Traditionally this means lining the bottom of planters with rocks, which makes the containers heavy and unwieldy and can quickly turn a green thumb into a pain in the back. Enter John and Sarah Hoggatt, who discovered that the recycled plastic mesh John’s brother-in-law patented as a building material could double as lightweight, eco-friendly drainage at the bottom of a flower pot. Better Than Rocks works just like rocks do, allowing water to flow freely, yet trapping needed moisture inside the pot. Presto! 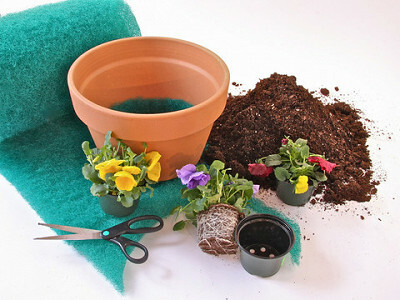 Pots are pounds lighter, making it easy to rotate them according to your plants’ sunshine needs. The result: a lush, long lasting garden you can enjoy all summer long and no more back pain. As a bonus, Better Than Rocks is also conveniently reusable. Simply shake out, hose off, and you’re ready for the next planting. Material for more effective weight ventilation and drainage in plants. Good afternoon! Welcome to Daily Grommet featuring our one of a kind planter drainage material called "Better Than Rocks". My name is John Hoggatt, co-creator of Better than Rocks, and I will be here to answer any questions you may have about Better Than Rocks. Our innovative product will make your planters lighter, and promote better drainage and superior plant health in containers of all shapes and sizes. This product is made from 100% recycled plastic and can be used year after year. Once you fit it to your pot, you can use it indefinitely. Once you try Better Than Rocks, we’re sure you’ll love it and enjoy beautiful, healthier plants! I look forward to reading your comments and will check in to answer your questions. I love the recycled materials, but will it work for plants like african violets which you're supposed to water from the bottom of the pot? What a terrific idea! I do long wooden window boxes each year with geraniums and ivy and they are so heavy with all the pebbles on the bottom. Is there any rule of thumb on how much material to put in? I would like to order some. My windowboxes are 6' long x 8" deep x 8" wide. thank you! Great Grommet. Another great Grommet discovery. Just ordered. In addition to all the benefits noted in the video, here's another: The price of this product is easily cheaper than the price of bags and bags of potting soil that I'll not have to buy this year. But it's the light weight and the handling of too much water (when raining) that are key in my mind. Thanks. John Hoggatt and thanks, again, Grommet for another "discovery." With African Violets, you would only use 1 layer and assuming there are no drain holes, the material would act like a reservoir. So you would have water in the bottom to keep the Violets' roots wet, if that is the desired growing environment. In some of our planters, we have added a drain hole on the side of the container to prevent too much water buildup in the pot itself. 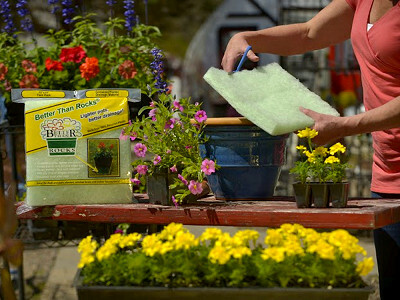 Hi Sarah - Better Than Rocks works great in my window boxes. I only use one layer in window boxes because they are not that deep. The material creates an air pocket in the bottom of the planter which helps keep oxygen in the soil. Oxygen is required for plants to absorb nutrients from the soil. That's why rocks and pebbles don't really work at all! The BTR roll is actually 16" x 8 feet long. So if you do more than two of that size box, you should get two rolls. Let us know if you have any more questions! Hi! I am just curious if the material gets moldy in the pots or if you need to wash it and dry it after the season is over? How do you care for it between seasons? We forgot to mention that this Grommet idea came to us from Claudia Thomas, who has a wonderful garden on Long Island. And she happens to have been my college roommate for four years! I will never forget the fall she came back from working as a gardener all summer in California...all tan and buffed from the strenuous outdoor work. She taught me a lot of what I know about gardening, cooking, and even life. Joan - Better Than Rocks is made with an antimicrobial in it. So far we have never noticed any mold or other nasty things growing in the material in over 10 years. 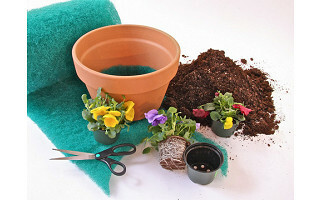 At the end of the season, if you choose to empty the soil in your pots, just rinse it out with water and put it back into the pot. It will be ready to planted again in the spring. I love the concept but why is it so expensive? If the cost was less probably more stores would carry it, more exposure to consumers, then more profits to you. Any comment? @Ann: I will forward to John for a his insight. I live in an adult retirement building. I would love to grow flowering plants in my room or in common rooms,Do you have suggestions or plans which would make doing this easily possible? I am an 87 year old lady. I would not be surprised to discover others here who would also be interested. @Jean Spelman: That sounds like a great idea. You should speak with some of the workers, volunteers or visitors to your community to see how you can make this happen. Best of luck to you with your project! I just love the idea. I m based in Dubai UAE. Would love to get in touch with you for further business details. @Amjad Durrani: I have forwarded your message and contact information on to John. Thanks for stopping by today. I'd like to grow organic vegetables. Since this is made of recycled plastic, I was wondering about the safety of my food growing in pots with this material. Any light you can shed on this? Container gardens are magical. Whether they’re made up of colorful flowers or stunning foliage, they can turn an ordinary rooftop into an urban paradise, or transform a bare front porch into an inviting retreat. Smart gardeners know that the key to keeping plants healthy is good drainage. Traditionally this means lining the bottom of planters with rocks, which makes the containers heavy and unwieldy and can quickly turn a green thumb into a pain in the back.